This article continues the discussion regarding the ideal software tool for automating the production of composite materials. The fewer dart used, the better, as they disrupt fiber continuity and load paths. Darts are cut so that when the material is dropped into the mold, the material can conform to the tool without excessive deformation. In addition, dart patterns need to be staggered, so darts in multiple layers are as far from each other as possible and don’t overlap. Whether as part of the production design or as an aftermarket add-on, the use of composite materials provides an answer to light weighting challenges facing the automotive industry. In order to be truly effective, tools for automating the dart generating process must work in both the 3D design and 2D pattern environment. This provides the designer with the ability to simultaneously visualize the impact of the darts on design and production. Due to the anisotropic nature of a typical woven composites, automation software solutions provide several ways to describe the material properties prior to final pattern definition. In the case of ExactFlat, this function is addressed using the Bias Flatten tool. After the grain line direction is defined, this tool is used to specify all of the other key characteristics of the material including fiber strength and spacing. The Bias Flatten tool in ExactFlat allows designers to specify the precise characteristics of the material. Ensuring more accurate patterns. Any useful patterning software for composite design should allow the user to extend the edge of the pattern out beyond the edge of the part. This allows for some sacrificial material to be trimmed from the finished laminate. Often a scribe line is etched into a tool to show where the part needs to be trimmed, or a composite trim jig is made to scribe the part. Once the 2D pieces are defined along with darts and trim material, pattern piece nesting is done. Nesting refers to the process of laying out cutting patterns to minimize the raw material waste. For woven composite products several layers of the same pattern piece are needed. But each layer must be rotated at a precise orientation of the grain line. This is handled by combining multiple marker sets of the pattern pieces. Each with a grain line at a different angle and then nested as a single job. ExactFlat provides tools for Nesting of multiple versions for the same piece but at different orientations. This simulates the actual ply make up and helps optimize material usage. Click on the image to learn more. There are a few other points that would need to be addressed under this heading, but for a general overview, this conveys the basic requirements and processes. 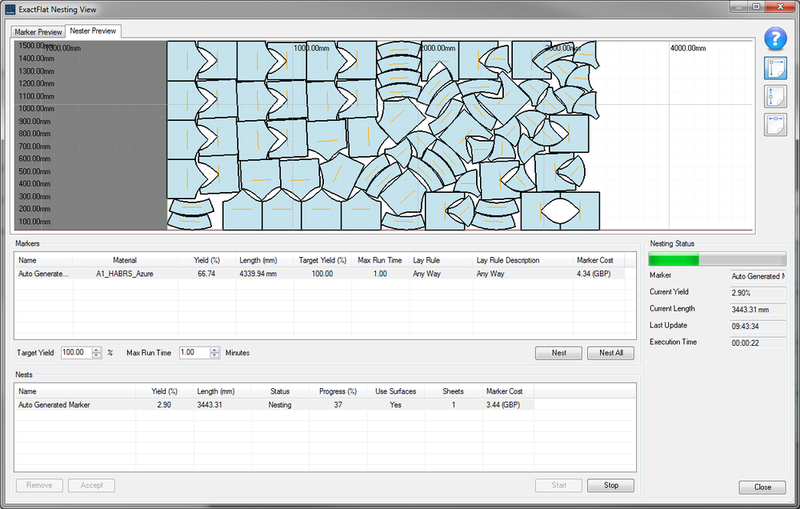 Digital Patterning can reduce the time it takes to create the pattern pieces used in the layup to just a few minutes. To learn more click on the link below and ask to speak with one of our experts.